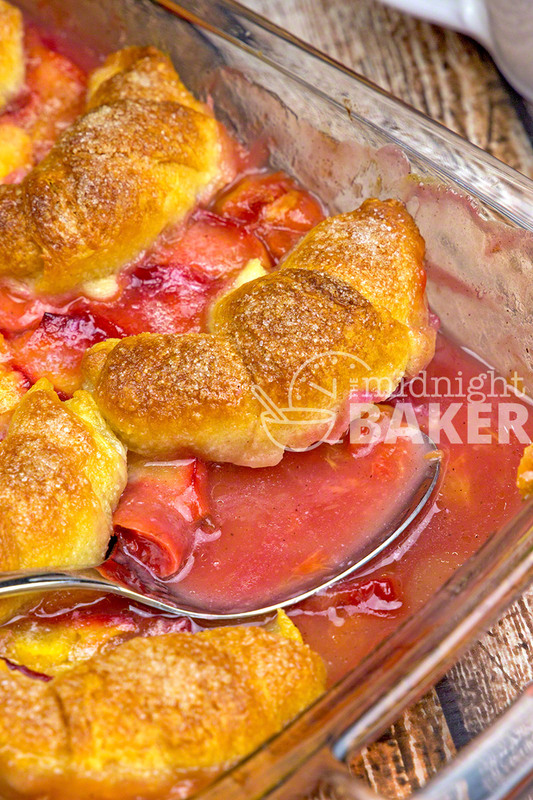 Easy and delicious cobbler made with fresh summer peaches and refrigerated crescent rolls. It “blushes” because you don’t peel the peaches! Fresh peaches were on sale at one of my stores this past week, and I couldn’t resist since they were the first of the season here! I dickered whether they were for cooking or eating–and it was a difficult choice. I chose to cook them in this great dessert. 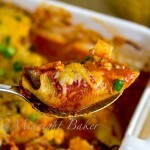 The original recipe comes from my friend Holly whose blog is Spend With Pennies (Cook Crave Inspire). 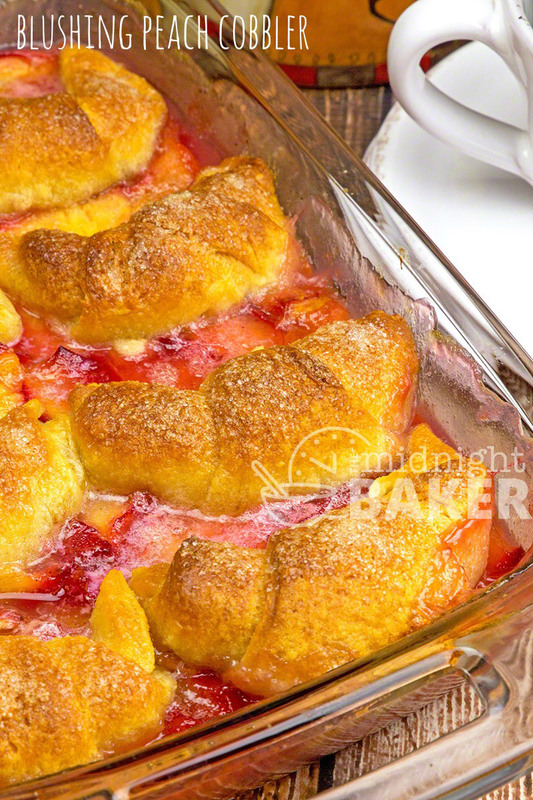 Holly has this great cobbler she makes with canned peaches and crescent roll dough. 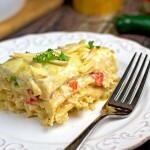 Something like this is right up my alley because it’s quick, easy and delicious. I adapted her recipe using fresh peaches, making a pseudo pie filling that will cook right along with the cobbler. I’m not a huge fan of cinnamon with peaches; I prefer allspice. But you can use the cinnamon if you wish. Another thing is I didn’t peel the peaches. This gave a nice rosy glow to the cobbler. My mom never peeled peaches or apples when she made pies with these fruits, and I carry on her tradition. She always said that it added a bit more fiber. I also “deconstructed” Holly’s recipe–I just place the rolls on top of the filling. The crescent rolls cook up nice and sweet and buttery. I drizzle them with butter and top them with sanding sugar. OK, I know most folks don’t have sanding sugar on the shelf, so you can just use regular sugar. The thing about sanding sugar is it doesn’t dissolve very easily which makes it a great decoration. But it’s only large-crystal sugar. This is so good served with ice cream! Plates and cups from the Osteria Tuscany Collection by Tapinassi. Available through Allora. 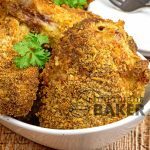 Preheat oven to 350 degrees F. You will need a 11 x 7-inch baking dish. 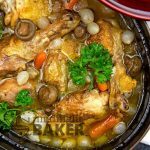 You can also use a 9-inch square pan. Place sliced peaches, lemon juice, ½ cup sugar, flour and allspice/cinnamon in a large bowl; Toss with your hands so everything is well mixed. Place peach mixture in the baking dish. 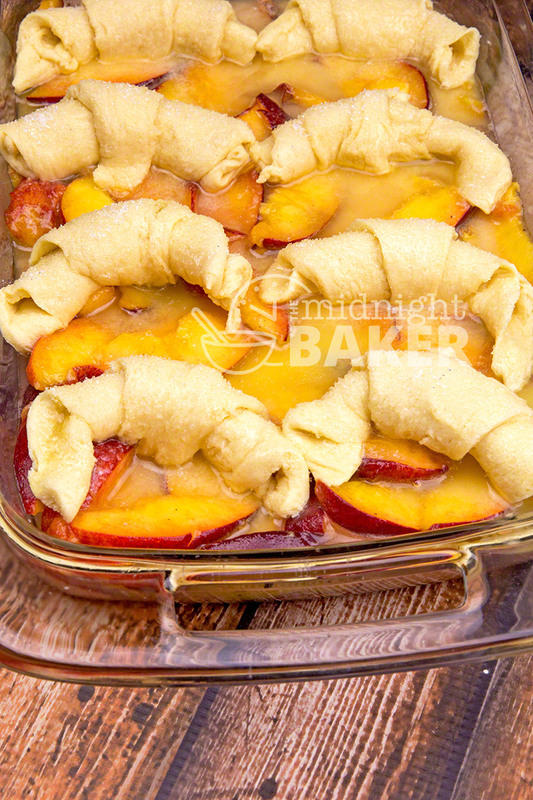 Roll up the crescent rolls and place evenly over peach mixture. Drizzle the crescents with the melted butter and sprinkle each roll with the sugar. 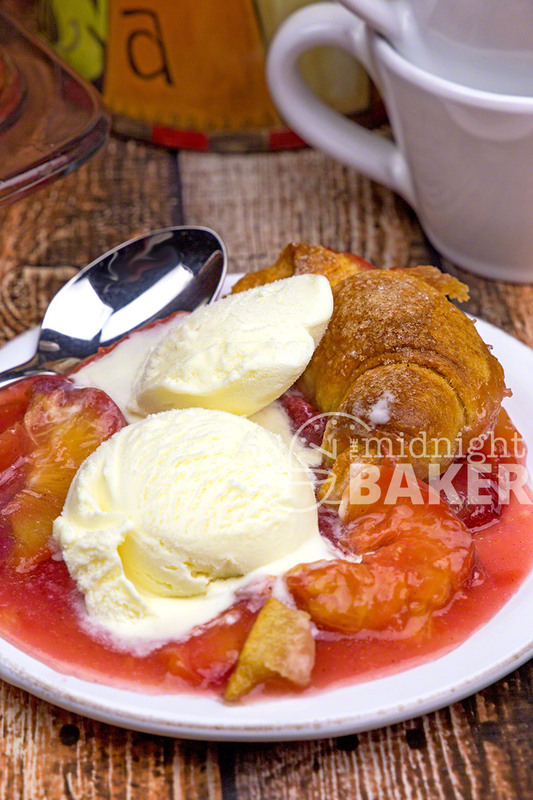 Bake for 35-40 minutes or until crescents are nicely browned and peach mixture is bubbly.